This morning I woke to howling wind with gusts up to 45 mph. This wind is from the same weather front that I left San Francisco to stay ahead of. I stayed ahead of it for days until the early morning hours of today when it rushed in with winds from the remaining low pressure north of me, now with a dry front. 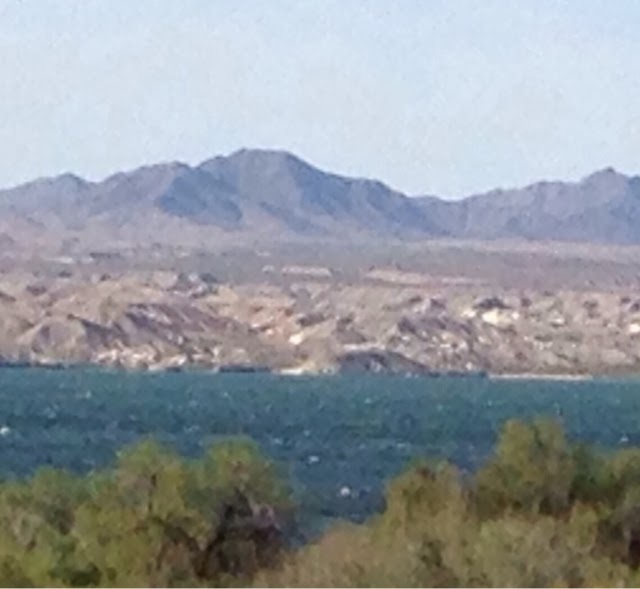 Provided for whitecaps on Lake Havasu. It is a cloudy day too so the strong wind doesn't make for a good day to ride a bike or toss a frisbee but it is good day to do laundry. At the laundry I met a 30's something woman who had a lot of laundry to do. She was embossed with a number of tattoos on her shoulder and arms. She seemed in a rush moving from washer to dryer then to her pickup truck and back. We got into a conversation and since she had been there before she gave me some pointers on the machines. "Use the large dryers as you only have to put in $.25 at a time vs the small machines that you have to put in $1.00 for a full cycle." That was good advice! She is from California and had lived in Havasu before but went to CA to live near her family but it didn't work well due to the cost of living there. She came back to the area to work in the resort service industry. She is now doing well in this industry with the number of tourists that come through the area and her and her husband can now afford to purchase a house. There was WIFI at the laundromat so it provided me the ability to update my IPhone & IPad and not put in extra time at McDonalds. My destination today is Quqrtzsite, AZ that is about an hour drive south of Havasu. 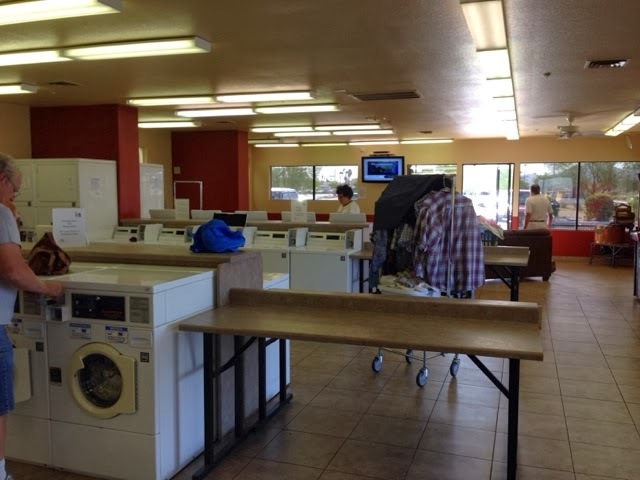 With the laundry stop and short drive I will have time to look around Quartzsite and stay at one of the government land campsites that do not charge for camping. The Bureau of Land Management runs a number of campgrounds in the southwestern US. In the Quartzsite area there are 4 or 5 places with a couple free and a couple are paid. In pulling in today to the free campground, all I knew from the software on my phone was that it was free to camp. It is just off of I10 and 125 miles west of Phoenix and 20 miles east of the Colorodo River. Not out in the middle of some government land that is miles from civilization. I pulled in and met the campground host and registered. I got into a conversation with him and he gave me the following information. 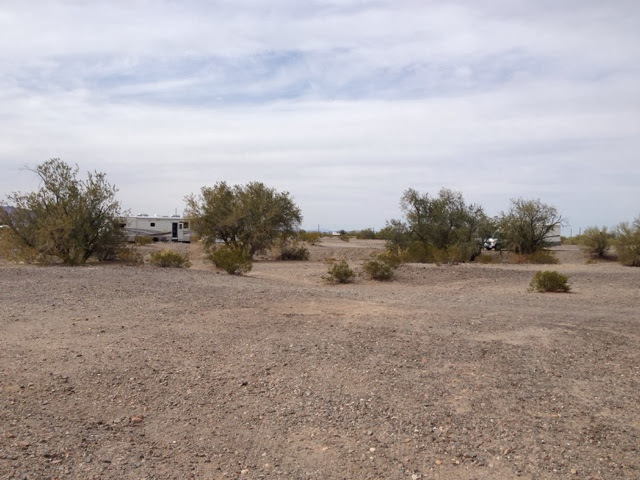 The Bureau of Land Management runs this free short-term camping area in Quartzite, Arizona. There are no designated campsites and you may camp anywhere within the boundary of the site. This one area has about 2000 acres. This is the campground and you can park anywhere you want. 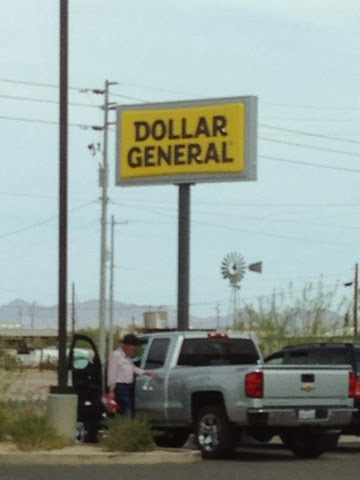 This site is located within a mile of Quartzsite. There is another BLM campground a half mile closer to town on the same road wher you pay to stay. So, why would you pay? What do you do for bathroom, fresh water, and trash? There is a whole industry in Quartzsite to support the Boondockers. There are pay for dumping your sewer and pay for water, etc. There are also propane filling stations and cheap general store places like Dollar General to buy things. This is not an upscale town like Havasu. It is very basic and functional. Denise asked tonight what do I do with my human waste. I could flush and carry it in the camper tank until I can dump, but this isn't what I do. My gray water (sink water) I use a dish pan and dump it like camping. I do not carry it but I could and have on this trip. I just don't know if I will be dry camping for awhile so I want to keep my tanks low on waste now. Ok, what about your human waste? 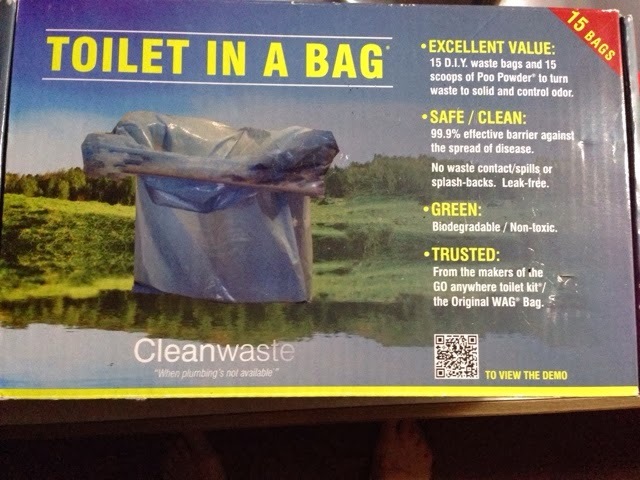 I bought the Clean Waste "wag bags" before I left on my trip. I place them in the toilet bowel in the camper I put the special chemical in to make liquids solid. Them use it tie up the biodegradable bag and it becomes trash for disposal. They make a nice portable collapsible toilet stand and it can be carried in a vehicle if your camper doesn't have a toilet. See www.cleanwaste.com for the details. 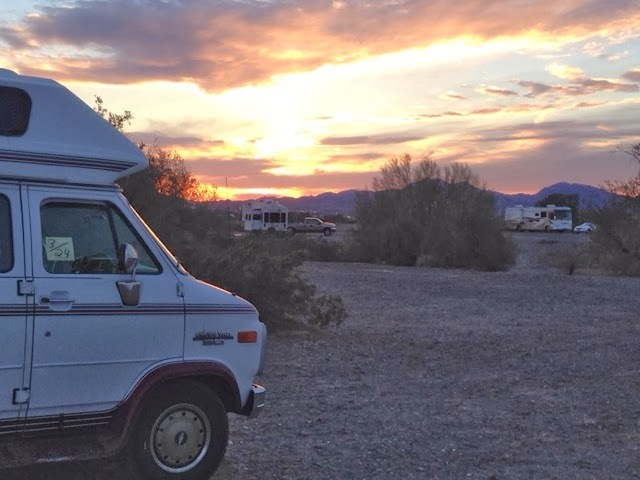 Quartzsite is known as a place where many RV'ers come for the winter. 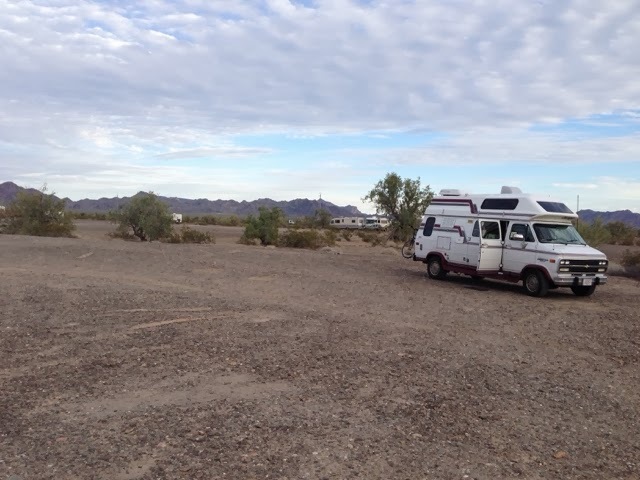 There are also many traditional campgrounds in the area with full hookups. There is a number of people out there that like the adventure of this idea of being off the grid and everything else. I saw an old RV today with a fixed 4x8 solar array on top at 45 degrees. When you park out here you can position your vehicle as you see fit. Quartzsite is also world famous for its gem shows and outdoor swap meets. The camp host here is a 50 something couple who mostly live this way now. They were staying at the paid campground and put in their name to be a host and they got this assignment. They hope that now with experience as host they will be up for a better location with more services (water, electricity, and sewer) next year. I have been to places where the camp host had services that were not available to campers. This couple are from Oregon and have been a campground host in Idho in the past.